“All I have to say is, black lives matter,” said young Briana Briscoe in a video of protests that erupted on Saturday, April 25, in response to the death of Freddie Gray, a 25-year-old Baltimore man who died under suspicious circumstances from injuries he sustained while in police custody. In the video, Briana described Gray as a lovable man who would buy the neighborhood kids ice cream. “I miss him so much. He was like a brother. He always used to play with my sister,” she said. Gray was laid to rest in Baltimore on Monday. Shortly after the funeral, protests and unrest broke out in the city. 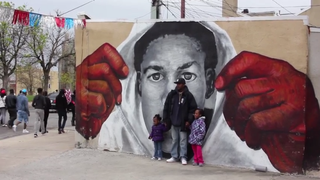 In the video, posted to YouTube by Stefanie Mavronis, a producer for The Marc Steiner Show and the Center for Emerging Media at public radio station WEAA 88.9 FM in Baltimore, protesters spoke out about Gray’s death and how they believe that a “police state” has emerged in Baltimore, with officers targeting the community that they had sworn to protect. “There’s no way to get change without getting out in the street,” said one elderly woman. “Under Martin O’Malley [former Baltimore mayor and former governor of Maryland], there were a hundred thousand arrests in one year, and that was unconscionable,” said Catholic Worker Brendan Walsh of Viva House in the video. In the video, protesters talked about the negative perception many have of Baltimore’s poor community, pointing out that those views may have been colored by everything from actual crime stats to the hit HBO drama The Wire, which was set in the city. They also talked about the history of police violence toward residents and how attempts to get justice for those hurt or killed by police have so often been futile. “For Freddie they didn’t have a charge, and they’ll make up the charge. That’s what’s going to happen,” Walsh said.